Let’s face it…. truth time….. In our lives we’ve all had relationships with scales… and it’s usually a love/hate relationship. THE SCALE – our judge, jury, condemner, slammer of our self-esteem and worth. The “thing” that has the ability to take our good, happy day and turn it to crap based on what numbers dial up like a slot machine in Vegas. Those numbers can make us feel like a million bucks or a huge failure. If the numbers are “good” we allow it to stroke our self-esteem… like our personal value is hinging on those numbers. If we determine they are “bad” then it can single handedly take us down, making us feel instantly bad about ourselves. Might as well paint a big loser symbol on our chest and send us out into the world. Let’s establish this right now… you are not “just” a set of numbers… ok ?? There is far more to you than a set of numbers. Now, don’t get me wrong. The scale does have a value, but it’s a tool, and there are times we need to use that tool, but use it wisely. When I started my fitness journey, I needed to lose weight, and my weekly weigh in’s were important to my progress. Did you note the key word here? Weekly. Not many times in a week, a day, or several times a day, weekly… once. I won’t lie. I was in the same boat. Some weeks, I loved the damn thing. Other weeks, I had to resist throwing it out the window. I understood for my progress to be successful it needed to be slow and steady, which it was. Some weeks there was more, some less, but it was forward movement. You know what that scale didn’t tell me ? What it doesn’t tell you? The scale also doesn’t show all the cool stuff that is going on INSIDE you. It doesn’t show your lab tests improving, your heart and lung health getting stronger, your resting heart rate getting lower (and a whole lot of other scientific stuff) or the way you think of yourself, your growing confidence and stronger self-esteem, or the way those workouts help you feel less stressed. Nor does it show how empowered you are becoming with each workout and positive step forward. No. It won’t show you any of that. Being a certain number doesn’t make you “healthy”…. nor does striving to just be “thin”….. it can make you skinny fat which basically means you have more body fat percentage than lean muscle mass. Ah, the benefits of building lean muscle mass… another topic to be pursued…. The goal shouldn’t be to get “thin”. Oh, years ago when I was starting to lose weight that WAS my mentality. “I just want to be thin and fit in size 10 jeans again!” at that point that’s all I knew….all I wanted. Make the scale say less… life would be good. But then…. things happened along the way. Yeah, I was losing fat. But other cool stuff was happening too. Losing fat let my muscles start showing up. Lifting weights wasn’t just giving me some muscles but making me stronger for ALL of my daily living. I went from cute 5lb weights to the 35lb I currently use. Running was shaping me in crazy ways. My legs are not only wildly strong but have awesome muscles. I can’t tell you the times total strangers stop me to comment my legs. My abs leaned out. Actually I can’t tell you a single area that running hasn’t improved on me. I got faster. I could lift more. I tackled projects in life without needing someone “stronger” to help me. I got mentally stronger….tougher. My confidence grew. I was empowered and didn’t ( and don’t) consider that there wasn’t anything I couldn’t do. Oh wait…… hold on ……. do you see my numbers at work here ? Defining me ? No, I don’t either. You see now days I’m more concerned about what my body can do, and how it can perform doing the things I ask of it, rather than if my numbers are bouncing around on any given day. Today I can’t think of a better compliment than when someone tells me I look strong. I honestly get on a scale maybe twice a year and it’s at the doctors office. Total freedom. You see the scale was a “tool” to get me moving. I used it for it’s purpose. It allowed me to see my efforts of eating better and moving more were having results. Today, all my clothes are single digit sizes. Remember me mentioning all I wanted was to get back into my size 10’s? I never thought a day would come they’d be two sizes to big. As long as my clothes fit well, I don’t concern myself over numbers hopping around on any given day. I mean, why ? Don’t we have enough in our days to trouble us ? Enough negative to potentially bring us down? Do we need to give something like …a scale… that kind of power ?? Ok…. the take away for you my lovely 1.5 readers…. The scale is a tool. Use it as one ( wisely) on your weight loss journey. It is not your moral judgment. If you are at the weight you desire to be, how your clothes fit should be a good indicator of your weight, however, if you check in with it, once every week or two is probably enough. Remember, you are not defined by a number! It’s doesn’t give you value or take away your value. Focus on all the cool things that make you feel strong, empowered, and confident. Celebrate your body and what it can do. There’s only one of you in all your awesomeness. Ohhhhh how I’m loving your outlook on this topic. Also, I’m glad you put this out there in hopes that it might release the shackles from those who may be entrapped by the scale. When I first started run/walking to lose weight I would look to the scale once a week also as a “tool” but now I rarely get on the scale maybe once every 2-4 weeks and that’s just when I’m in training cycles prepping for races so I know where I’m at. Basically these days I base my weight off of how my clothes feel. I would like to re- blog this on my site. Is that ok with you? I love this post. So true. I have kicked my scales ( literally) more than once. Oh my gosh… wow… I’m so flattered… yes that’s fine… thank you! I read this post about the scales. 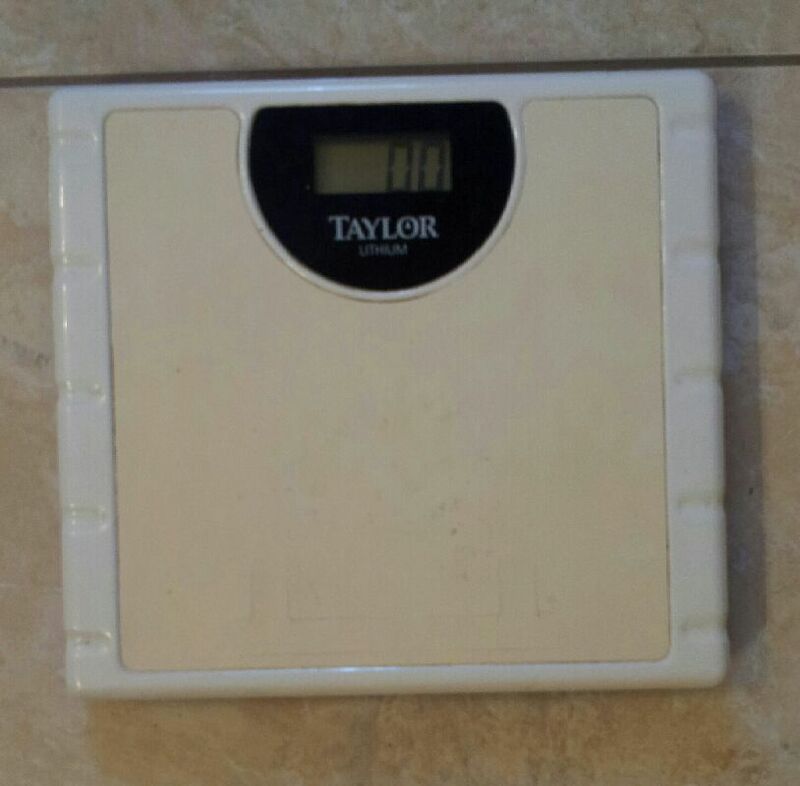 Since I have had so many fights with the scales myself, I could identify. (At least about the scales. I am no way as fit as sassyfitnesschick) I thought all of y’all would enjoy her post as well. I have kicked my scales up against the wall before. That made me smile =) I’m glad! I am not opposed to a daily weigh in when I’m trying to lose weight and weekly when I’m trying to maintain. When I am constantly bombarded with yummy food visuals, it helps me to have that scale visual to remind myself why I am making better choices. And if you can keep it in it’s proper perspective… awesome! For many it becomes a negative on their lives as they forget to use it as a tool and not a life controlling device. For me, my clothes are a good reminder to not over do it 😉 thanks for your input…. Thanks for sharing at my link up today! Have you ever seen the article floating around about the dietician who weighed herself 20 times in one day, to prove a point? I think it was in Women’s health… long story short her weight fluctuated 9 lbs in one day! No I haven’t, but what an interesting experiment that I might try and share with my circle of influence =) thanks for sharing! Previous Previous post: You Run What ? ?